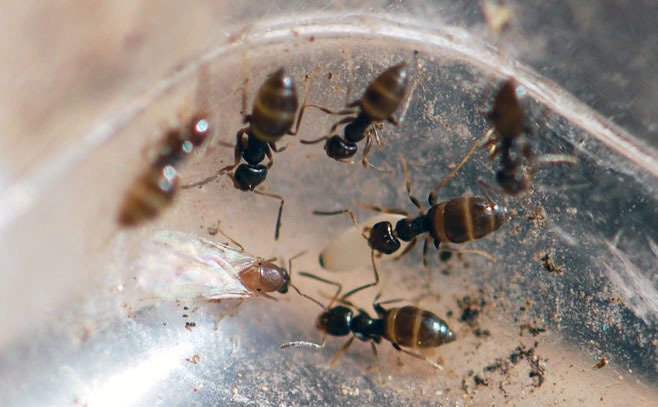 Whatever happened to that fraction of a rover ant colony we found in a flower pot? As any sensible colony would do under the same circumstances, they raised up some of the pale-colored males characteristic of their species. While trying to get a decent photograph of the males this morning, I noticed something else. There were workers with very swollen gasters. Like the worker in the far right. As you can see in this blurry photograph, not all the workers had enlarged gasters. 6Legs2Many also has photographs of Brachymyrmex males. 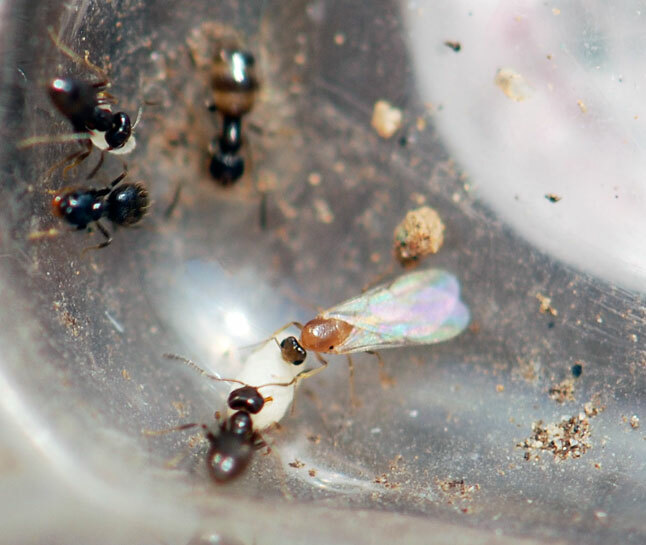 In an effort to learn more about rover ants, I have been searching for nests. 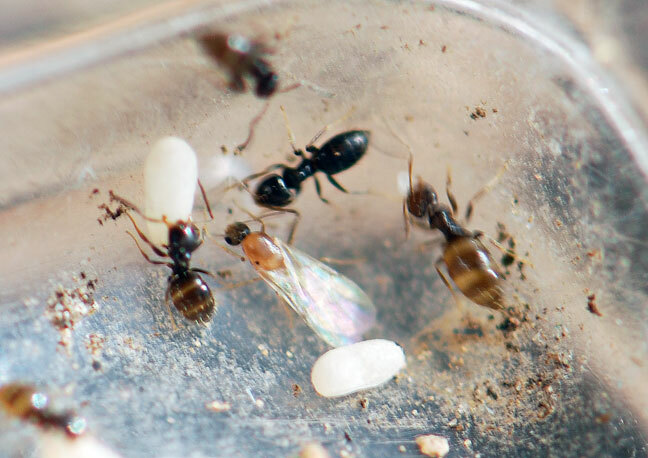 During the summer, we accidentally discovered several colonies when transferring potted plants, so we know they nest in those. 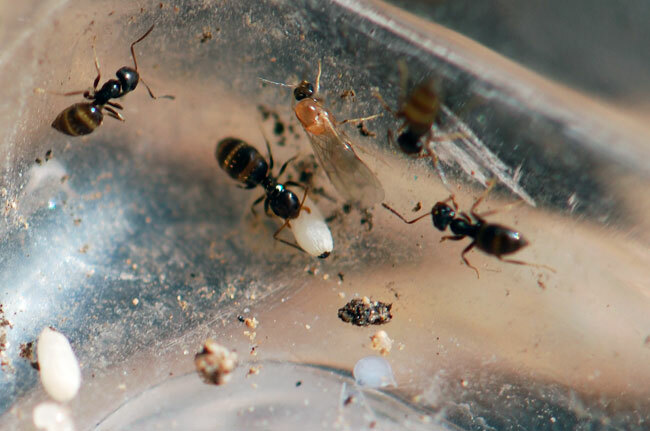 We also watched a colony relocate from one nest in the soil to another. It was cool to see the big gush of ants along the trail as the queen and her entourage moved through. This week I found another place where some rover ants are hanging out. From a few feet back, it doesn’t look like much. 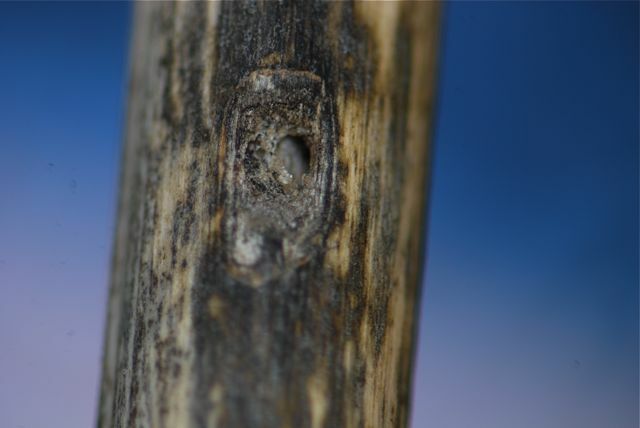 This is an old stalk from a hollyhock. Hollyhock stems are filled with a soft, white pithy material. It doesn’t look much more significant close up. 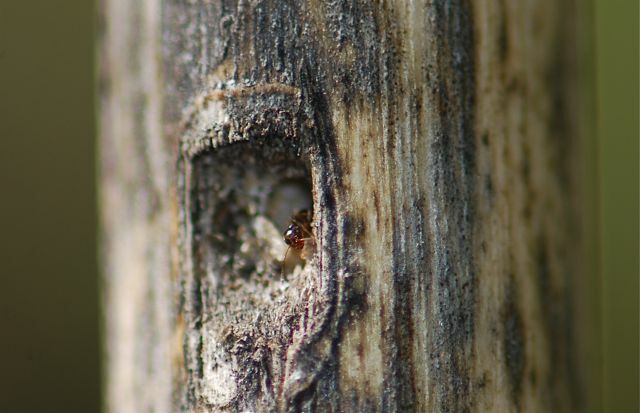 If you watch for a few minutes, however, it becomes apparent that some ants live here. Note to self: investigate that beige shiny stuff around the entrance. Any ideas? This one seems to be eliminating something. I wonder if that has anything to do with the shiny material? Most of these are fairly light-colored workers. It is also about 50 °F and shaded for the most part, so activity in the entire yard is way is way down. We’ll see what happens as it warms up again. By the way, the shape of this entrance leads me to suspect it was once created by another insect. 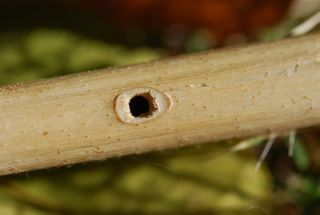 This is the entrance of the small carpenter bee, Ceratina that I found nesting in the hollyhock stalks earlier. 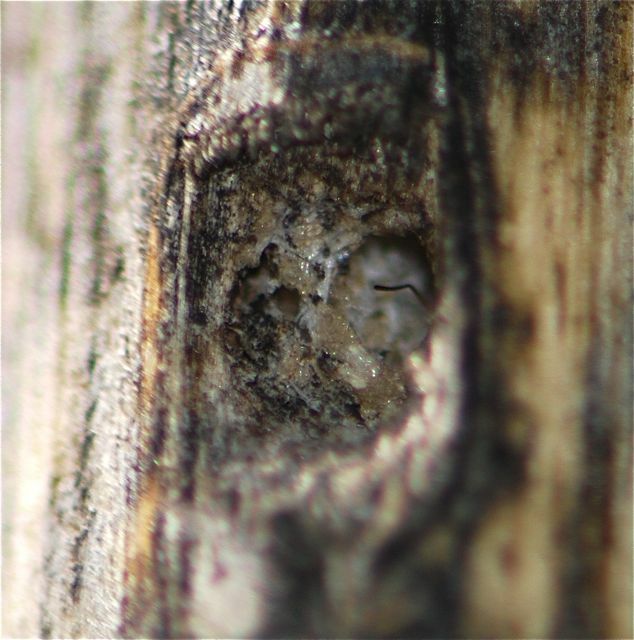 If the entrance above is one created by a carpenter bee, then the ants have closed it up a bit. So, is this a nest or some sort of bivouac? What do you think? Remember the rover ants from sweet tooth ants and the praying mantid encounter? I don’t think I have introduced you to them properly. 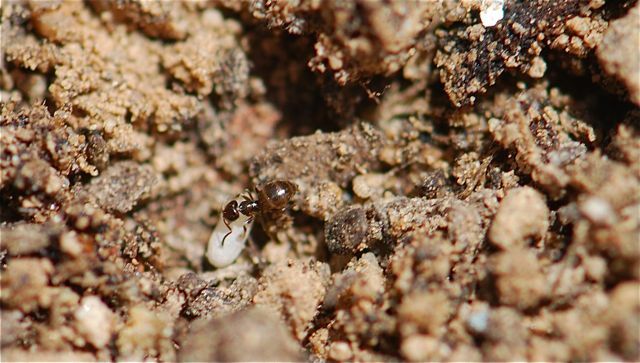 The “dark rover ants” (or simply “rover ants”), Brachymyrmex patagonicus, are tiny ants originally found in South America, interestingly from the same region as some of the other successful invaders: fire and Argentine ants. 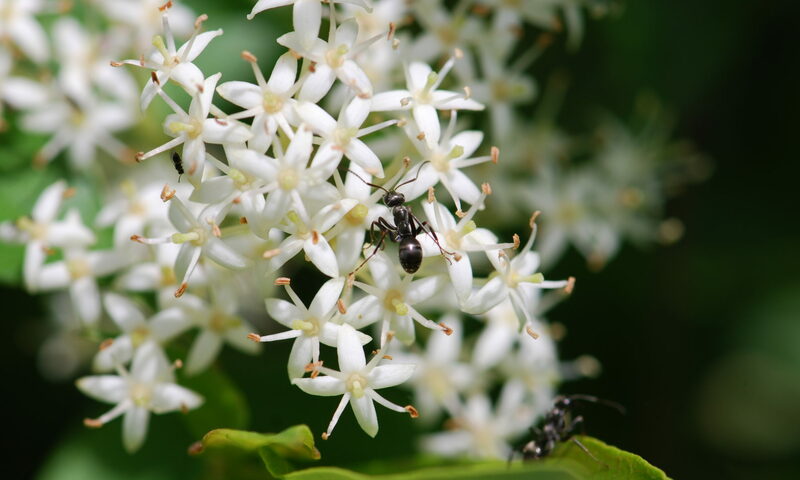 Dark rover ants were discovered in the United States in 1978, and have spread throughout the South and into Arizona. Not a lot of work has been published on their biology. 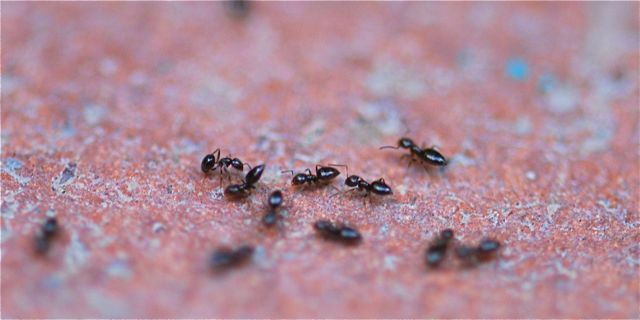 Joe MacGown has articles about their taxonomy and distribution, and explains that dark rover ants were called B. musculus in the early literature. Alex Wild has a nice summary of their status and an identification guide. 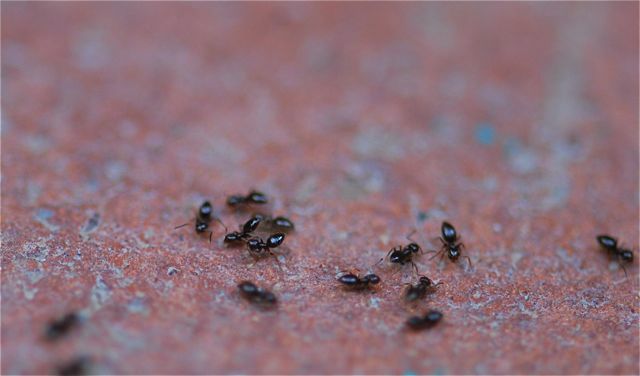 Our back yard in Phoenix is home to numerous dark rover ants. 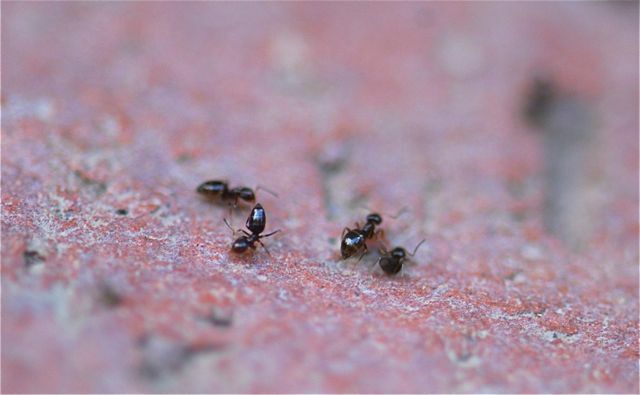 They nest in the potted plants, and have kept all other ants – except the native fire ants – pretty much at bay. I can not emphasize enough how very small they are. They are just about 2 mm in length. 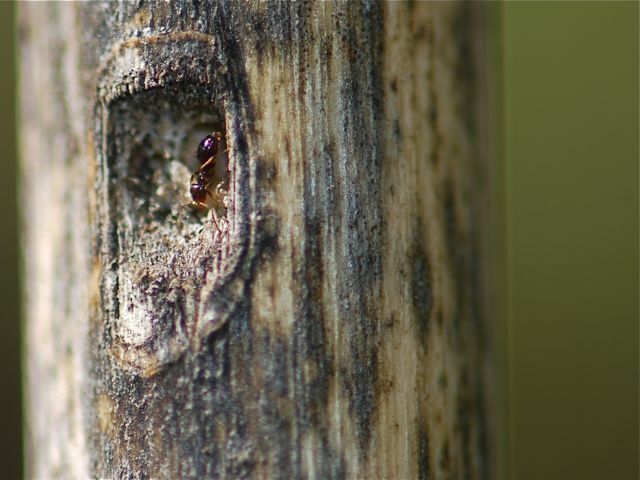 Rover ant is a good name, because you find single or a few ants roving everywhere. They trail up trees, but otherwise don’t seem to form distinct trails. In fact, I found their behavior to be rather ho hum until yesterday. That’s when we discovered what looked like a meet and greet between two colonies on our patio. (The photos aren’t very good. It was cloudy and of course my flash wouldn’t cooperate). 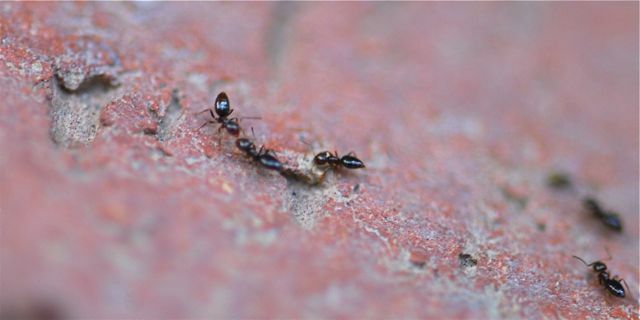 It’s hard to show the action in stills, but basically some ants were lined up having encounters with others. 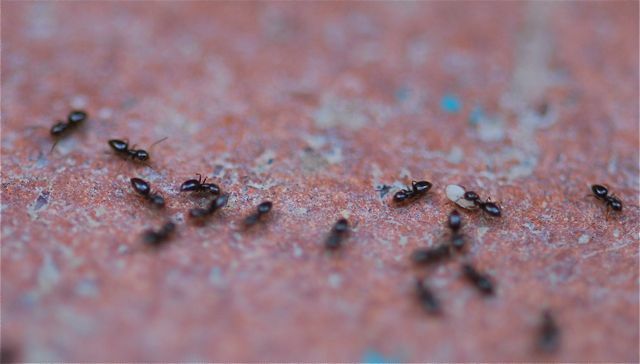 The ants would rapidly jerk back and forth when they met, possibly stridulating? (You would need an electron microscope to tell for sure, they are so small. :-)) The movement almost looked like they were getting a shock and jumping back. Some of the encounters showed definite posturing. 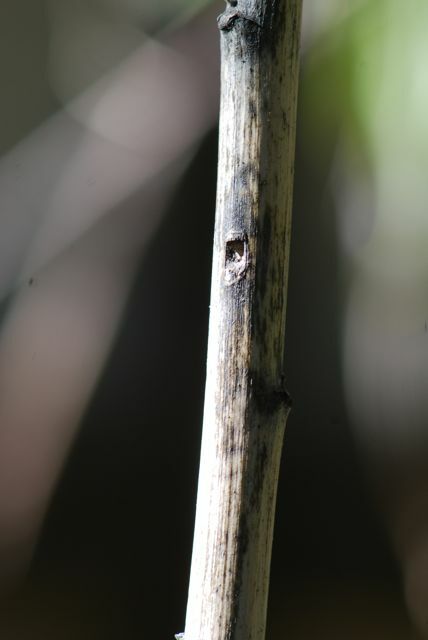 Some of the ants “crouched” with their gasters held up. 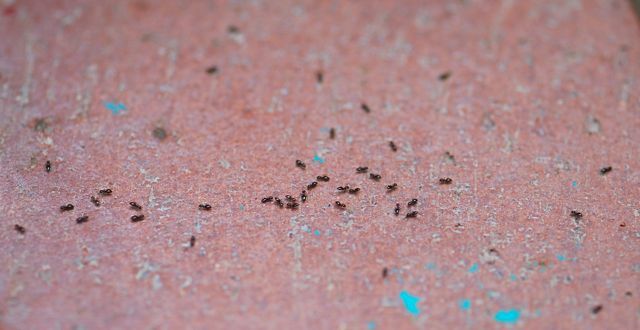 Some other ants were moving rapidly, often circling around in a half circle and then rejoining the line. Here’s a couple I caught with their gasters up. 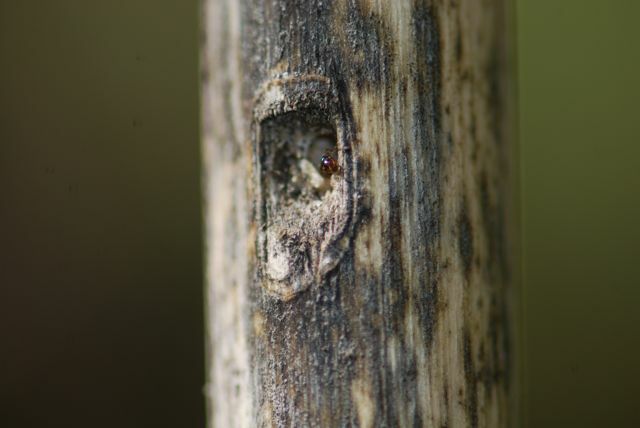 In this case the ant in front of the one with its gaster up seems to have lowered itself. Running through this gauntlet of ants was an occasional worker carrying a pupa. See toward the right. Unfortunately other duties called, so I couldn’t follow the action very long. 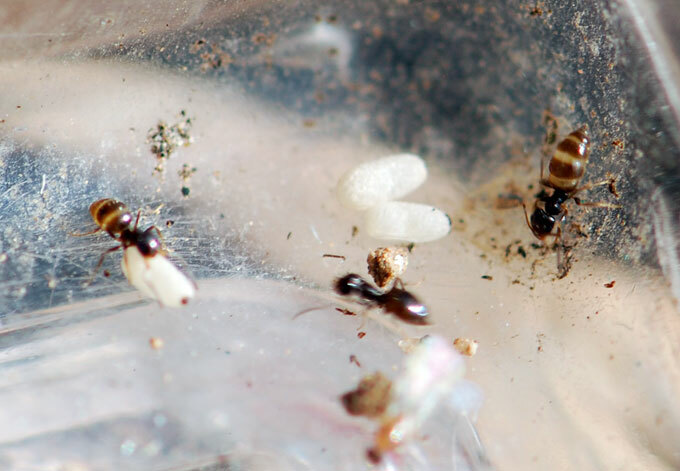 Watching what little I did made me think that these mini ants might just be worth investigating a bit more. Is it a case of ritualized posturing? A precursor to fighting? What do you think?